Is running the beautiful 21km stretch of beach between Swartvlei and Wilderness on your trail running bucket list? And how about the same run in the evening during low tide at full moon? Night running on the beach is like no other, ask anyone who has done it and they will tell you that it is a very special experience. 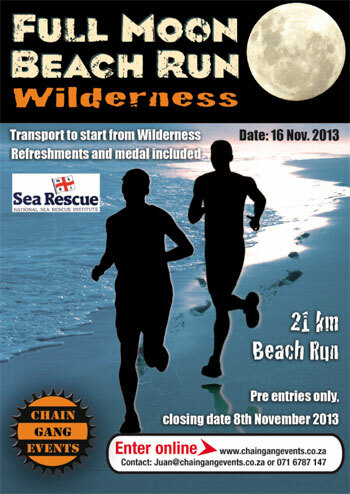 Chain Gang Events in partnership with Wilderness NSRI, the event’s official charity, want to help you tick this one off your bucket list, and run on what’s been described as the best stretch of beach in the country! Join us on the evening of Saturday 16 November. Runners will be welcomed with a coffee at registration at the Wilderness NSRI before being transported by the organisers to the start. Your car will be safe at the finish. Runners need to have all of their standard trail running hydration and safety equipment with them en route. The refreshment stop will be a welcome top-up approximately mid-way. Medical assistance will be available on route. Starting at Swartvlei Beach, runners will pass Gericke’s Point, the rocky landmark resembling a lion’s head. Thereafter enjoy kilometers of mixed sand and rock shelves with the warm Benguela current on your left and the fossilised sandstone dunes towering above you on your right. Passing Kleinkranz village and a mid-run refreshment stop, runners then reach Flat Rock and a few more kilometers of sand running to the finish at Wilderness NSRI. Come and enjoy the experience and support a worthy cause. Registration will start from 16:00 - 18:00 on the Saturday at the Wilderness NSRI office. This is a pre-entry event only (unfortunately no late entries) and entries close on the 8th of November 2013.